This course (updated for 2019) comes with a mobile-optimized 197-page ebook, audiobook, and bonus video lessons on Udemy. I started on Medium with 12 followers. My publication was an empty shell of crummy stories. I was not a good student in school (ask my professors), although I journaled every day for myself. Then I learned how to write a press release and I saw it get published in the local newspaper. A writer at Ooomf (now Unsplash) taught me how to write a blog post. I started writing about entrepreneurship, a topic I love. Then I wrote a viral story that shot my views from 152 to 94,000. It triggered my other Medium stories to take off. My work was republished in Business Insider, TNW, Smashing Magazine, Quartz, Observer, and Inc.com. I was given a column at Inc.com. I started writing at rates of $1 per word. My publication jumped into the top 40 on Medium. Today, it has over 90,000 followers. I quit my job to write full-time and I make more than I did at my agency job in Washington DC. You can do exactly this. In this ebook, audiobook, and bonus video course, I've taken everything I've learned not only from 5 years of writing and growing on Medium but also from a data analysis of the top 100 Medium stories of all time, and distilled it into 30 lessons that will transform the way you think about writing, on and off Medium. You'll learn creative ways how to make money writing without the Medium Partner Program, you'll learn how to write captivating headlines, and structure your stories so that they actually get read and shared. You'll learn writing skills that will benefit the rest of your career, like how to pitch editors at major publications, how to be vulnerable and emotionally connect with your audience, and how to pick the best photo and CTA for your stories. THE Question: Should You Lock Your Stories or Keep Them Open? What’s Happening With Medium Publications? Can You Still Make Big Money on Medium? The original ebook received a fresh edit and, with the new lessons and writing exercises (38 total), clocks in at ~30k words — 197 pages. 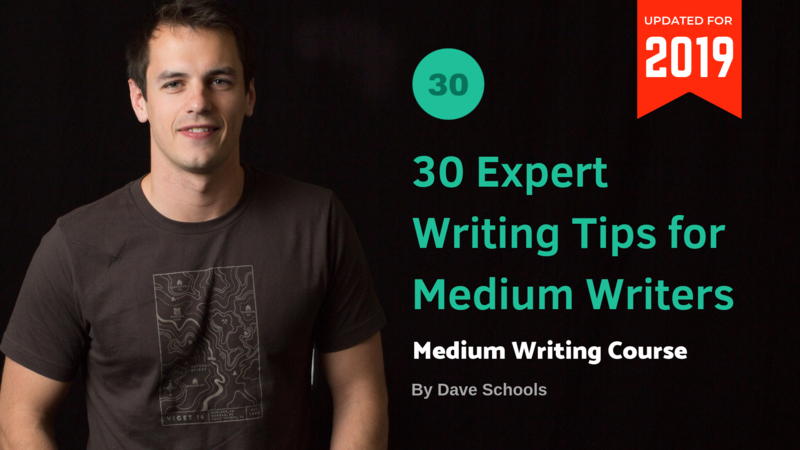 "'30 Expert Medium Writing Tips Course' is legit the best course I’ve ever gone through. I can’t stop reading it and I’m only at No.10. I can’t wait to start implementing your lessons and beginning this new journey." "There are so many great actionable items that push me to action. I have become a better writer because of the tips Dave mentions. And I love how he's sharing true numbers when it comes to getting paid." Below it says you'll receive a PDF file, but you'll also receive a password to get the audiobook and a discount code to get the video course for just $0. View mediumwritingcourse.com to learn more.